Small park close to Ware Town Centre with 1 Point of Interest. Small park, close to local amenities and within a short walk of the town centre. The play area has exciting equipment for young children including swings, slide and a sandpit. Ornamental planting has been introduced to maintain Buryfields character as a traditional town park. This area used to be Ware Town Football Ground and was redeveloped using additional funding from Glaxo Smithkline, who have a large site close to the park. Adjacent to Priory Street pay and display car park. Directions here. Further information on the car park including charges is available here. Close to a number of local bus routes. There are cycle friendly routes across the park. Free guided walk leaving from outside the Park Road foot entrance lower level of ASDA store, SG12 0AD. This walk is a Grade 1st steps (where 1 is easiest and 4 is challenging ) Refreshments will be available afterwards. The walk takes place every Tuesday at 2:30pm except Jan 1st. If you can't make this Hertfordshire Health Walk, there are plenty of others to choose from. Details are available from the Countryside Management service website. Hertfordshire Health Walks This Hertfordshire Health Walk is part od a countrywide programme of free, volunteer-led walks, which aims to help people get outdoors, get more active and reap the benefits. The walks are all sociable and you don't need any special equipment to join in, just comfortable shoes, To register to walk either sign up online at the Countryside Management Service Website or just turn up a few minutes early for your first walk. The programme runs all year round and offers choice of different walk grades, start points and times, including weekdays and weekends or evenings in the summer. For more information and a copy of our leaflet please go to your local library, GP surgery or council office or visit the Countryside Management Service Website. Free guided walk leaving from the Park Road foot entrance, lower level of ASDA store (SG12 0AD). This walk is classed as a First Steps and is buggy and wheelchair friendly. The meet point is close to public transport and refreshments are available nearby. The walk takes place every Tuesday at 2.30pm excluding Dec 25th and Jan 1st. If you can't make this Hertfordshire Health Walk, there are plenty of others to choose from. Details are available from the Countryside Management Service website here. 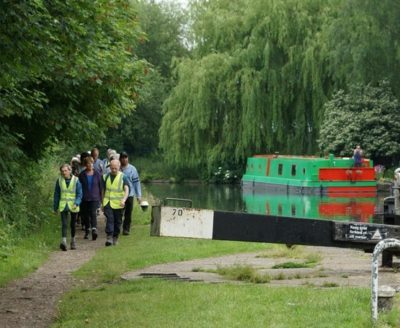 Hertfordshire Health Walks This Hertfordshire Health Walk is part of a countywide programme of free, volunteer - led walks, which aims to help people get outdoors, get more active and reap the benefits. The walks are all sociable and you don't need any special equipment to join in, just comfortable shoes. To register to walk either sign up online at the Countryside Management Service website or just turn up a few minutes early for your first walk. The programme runs all year round and offers choice of different walk grades, start points and times, including weekdays and weekends or evenings in the summer. For more information and a copy of our leaflet please go to your local library, GP surgery or council office or visit the Countryside Management Service website here.